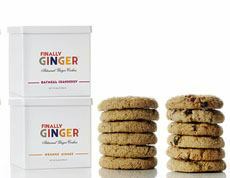  Finally Ginger artisan cookies are available in  gift tins and  snack packs (all photos courtesy Love From Cleveland). What a joy: delicious ginger cookies we didn’t have to bake at home. Cookies freshly-baked just for us, because they’re baked to order. Cookies with sugar and spice and everything nice. With three kinds of ginger: crystallized ginger, ginger root and ground ginger. All are delicious and very special. Who’d have thought that a classic ginger cookie, popular since the Middle Ages, could be improved? The tins are great for storing tea when the cookies are gone. Head to FinallyGinger.com to place your order. 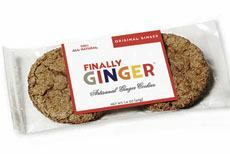 While Finally Ginger calls itself a ginger cookie, it is a hybrid—a hard cookie with a snap, with a textured surface dotted with sparkling sugar. 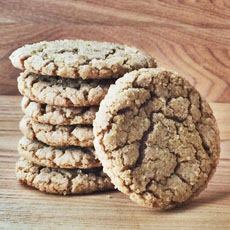 A ginger cookie is a soft, molasses-type cookie that is flavored with ginger and other spices. It is larger than, and otherwise differs from, a gingersnap Crusaders returning from the Middle East brought ginger and other spices. A gingersnap is a thin, plain round cookie with a hard, smooth texture like a gingerbread cookie. It is a smaller version of the traditional German Christmas cookie known as Lebkuchen. Like a gingerbread cookie, ginger snaps break with a “snap.” Gingersnaps contain a larger amount of ginger, and thus are spicier, than the chewier ginger cookies. Gingerbread is a fancier affair, often cut into special shapes (cottages, flowers, hearts, horses, people, trees, etc., along with 3-D houses and carousels) and hand-decorated with icing and candies. Monks made the first gingerbread for holidays and festivals. The tale of Hansel and Gretel, published in 1812 (as part of Grimm’s Fairy Tales), vastly increased the popularity of gingerbread cookies and other treats, such as gingerbread Christmas cards. Gingerbread men and animals became popular Christmas tree ornaments.